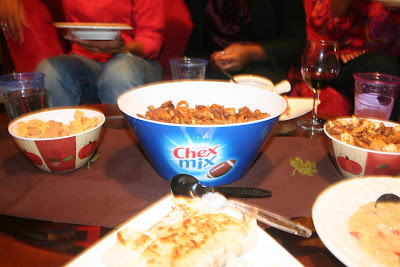 Last night I hosted a MyGetTogether Chex Mix Party at the house. And we had a great time. 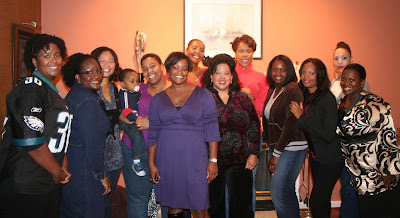 Not because of the Chex Mix, but due to the wonderful company & conversation with a great group of women. Now I don't know how in the hell I was supposed to feed 15 people with the 3 little bags of Chex Mix. Seriously?! They made a nice snack/finger food thing but didn't mount to sustenance...and these ladies came packin' an appetite. The conversation...I think we covered every topic under the son and almost came up with a way to achieve world peace. And even the game was good - what I saw of it. We had a wonderful evening. I'm looking forward to spending more time with everyone. P.S. Didn't get your evite for the dinner party? Send me a message.